Hello my friends! 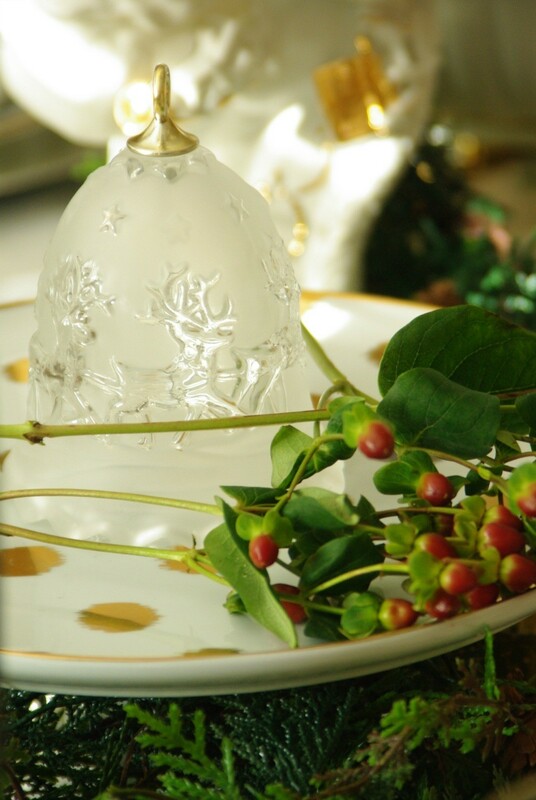 It’s tis the season time again and I’m so thrilled to be joining my dear friend Jann Olson for her Creating Christmas link party which begins today right here on my little blog. This has always been one of my favorite Christmas songs. I remember even singing it as a small child, and most likely because of the silver tinsel that always hung from our tree. 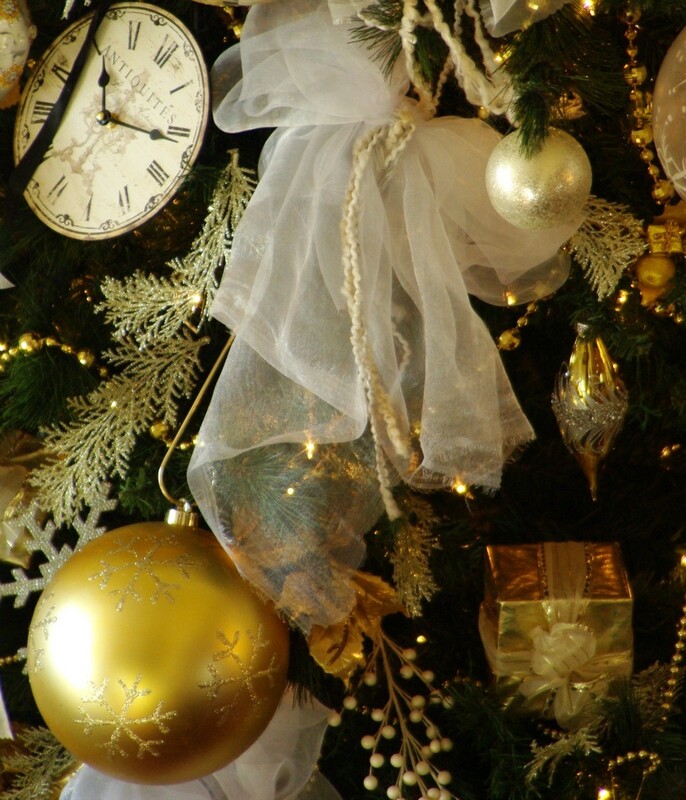 My mother always let us help with the decorating of the Christmas tree and I was one of those children who took great pleasure in doing so. 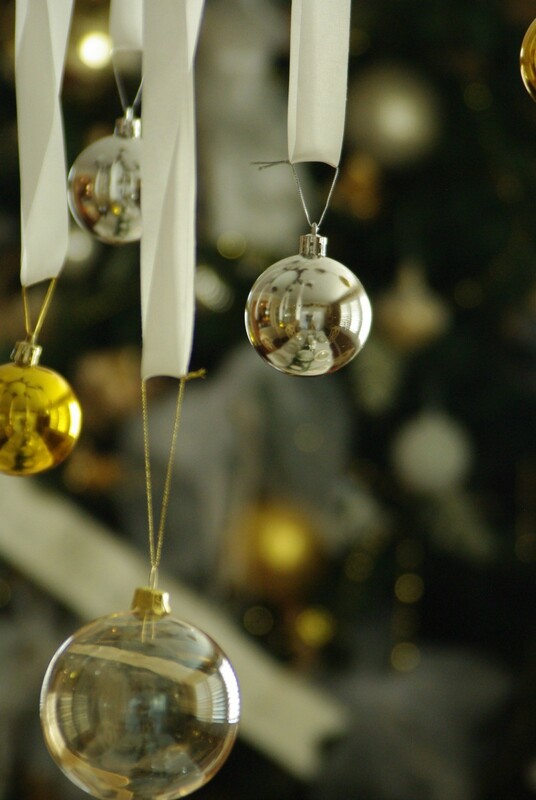 I would spend hours making sure every little ornament and piece of tinsel was carefully arranged and re-arranging after my siblings left their mark (haha). 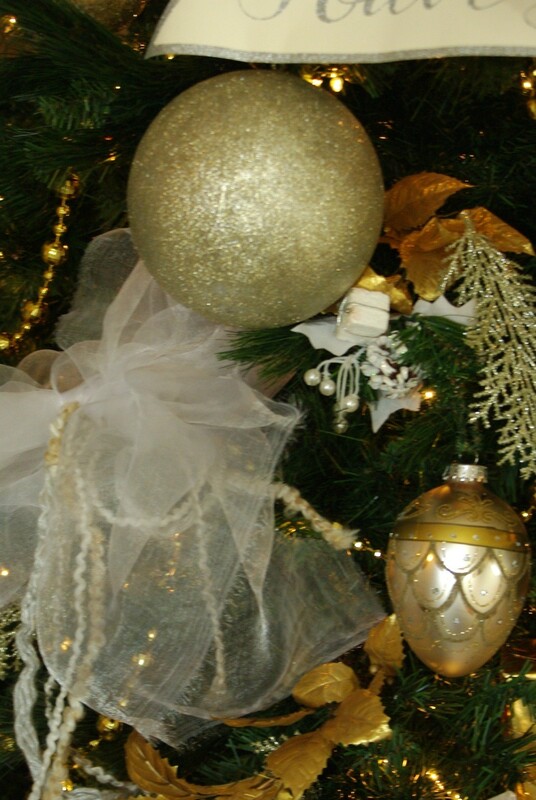 As the years have past, I still have that great love for silver and gold and although I have redone many different themes on Christmas trees I have always kept one of silver and gold. This one has its home in our main living room . 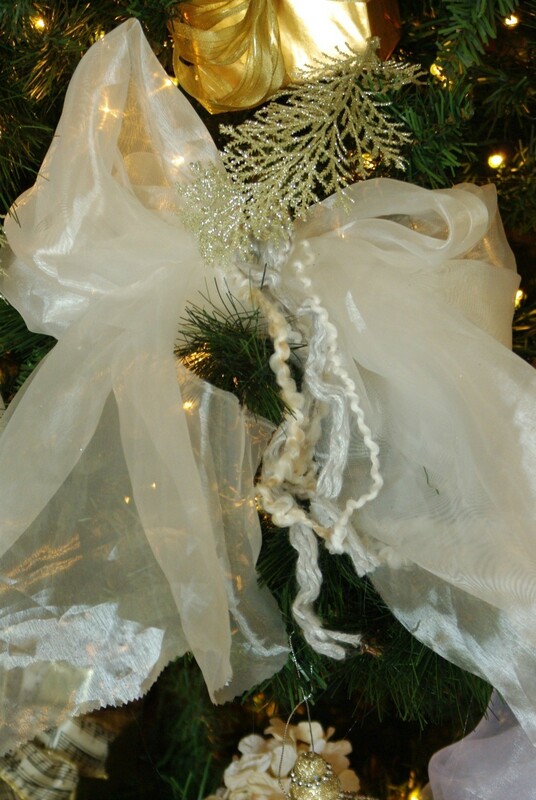 . .
It’s carefully decorated with homemade bows tied with silver and gold yarn . . .
miniature gold wrapped gift boxes . . .
ornaments I’ve collected over many many years . . .
as well as many fond memories. 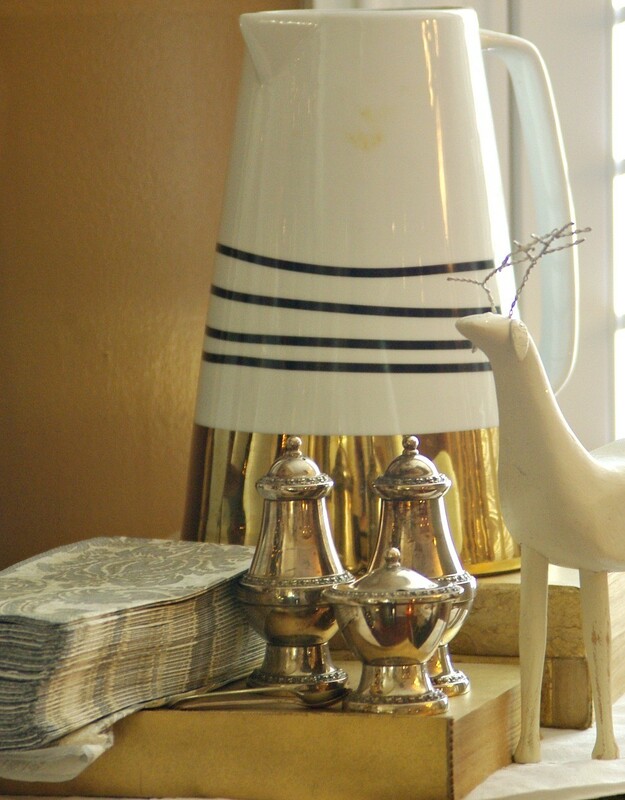 The silver and gold theme is carried throughout this portion of our home . 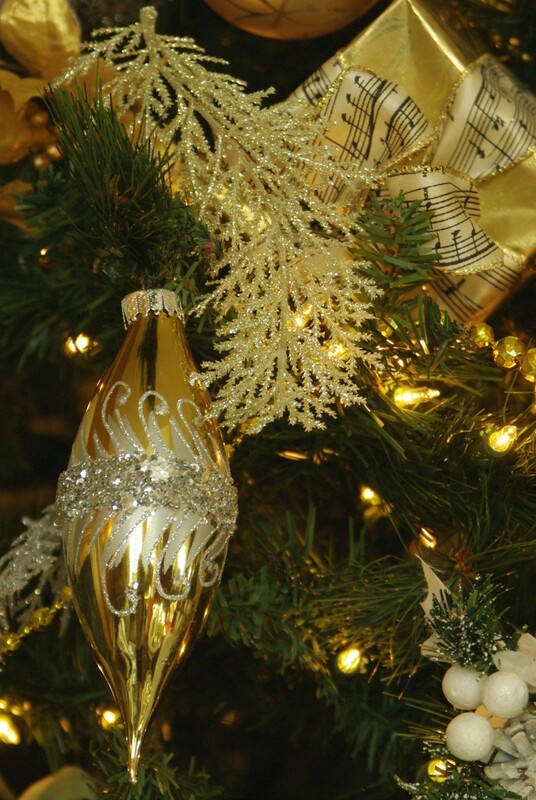 . .
With glittered branches on the piano . 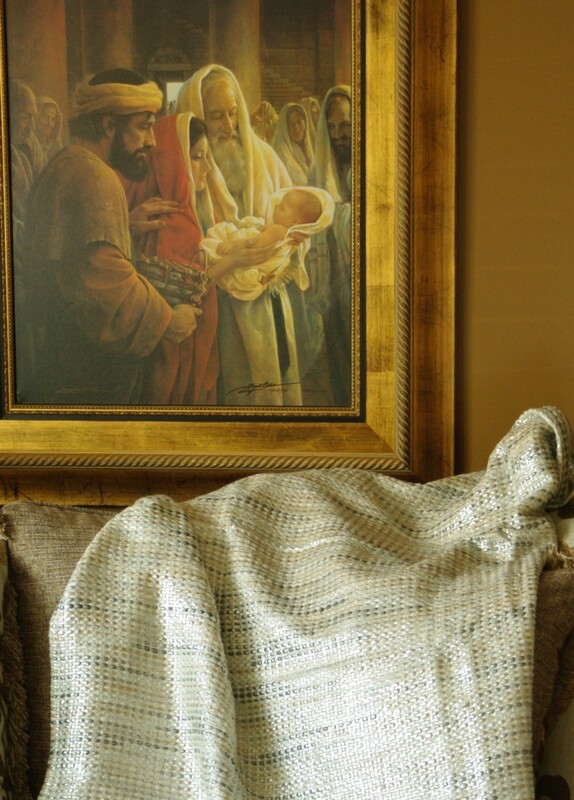 . .
to our nativity scene . . .
with the mirror display . . .
a treat station . . .
And of course the dining room table . 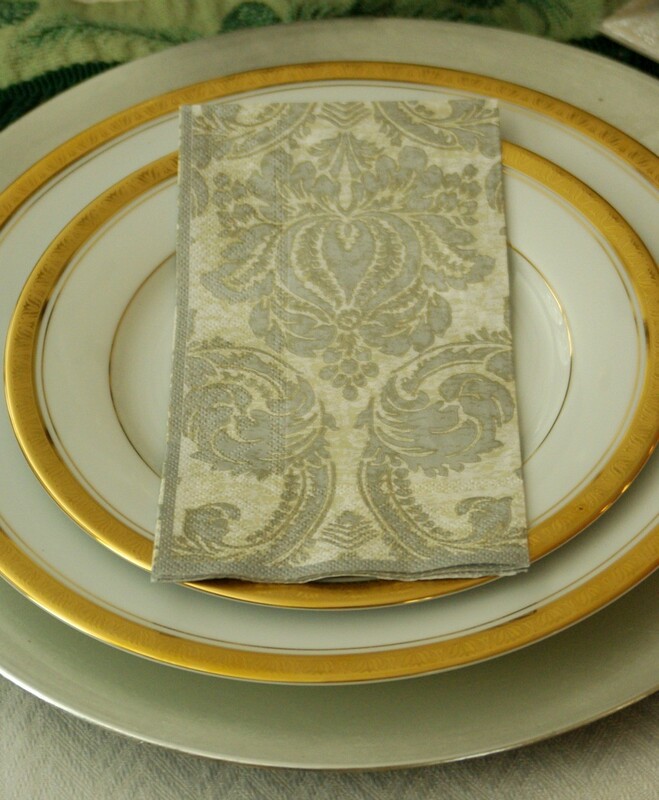 . .
with silver charger plates and white gold rimmed china . 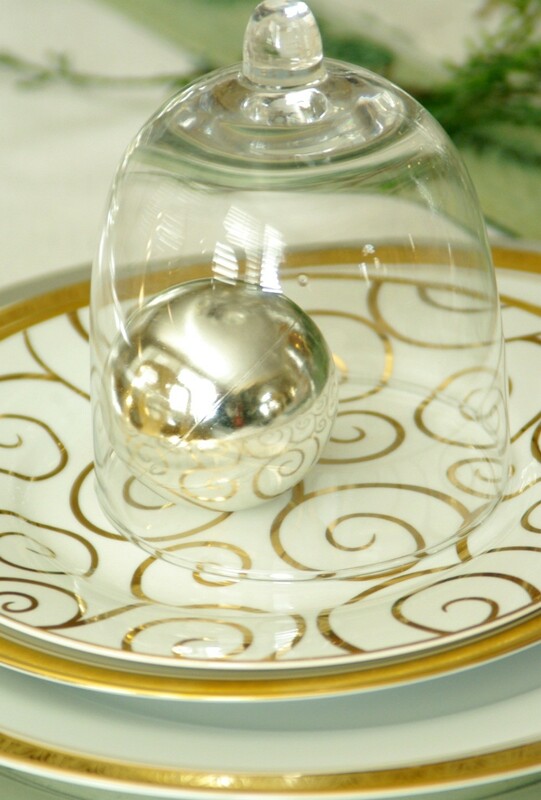 . .
write their names on an ornament and carefully place it one each place setting. 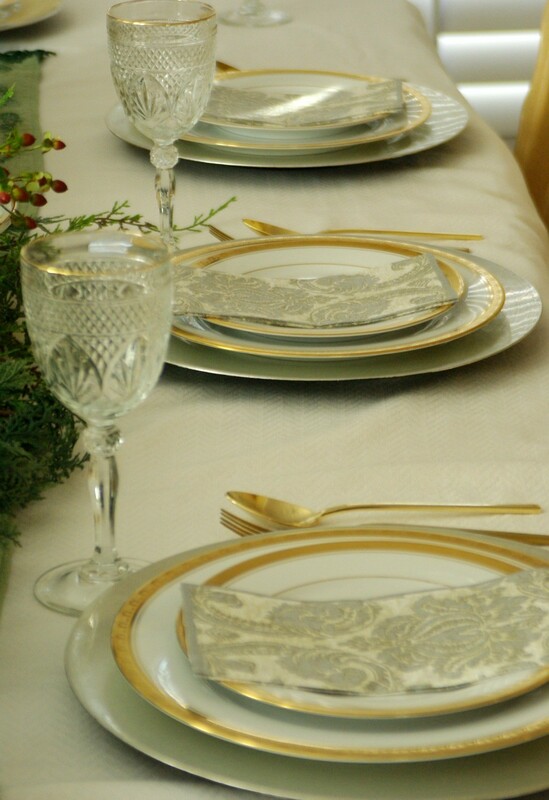 Then we have the tablescape of silver and gold. As I celebrate this season you may possibly find me slipping some of that silver and gold into my wardrobe . . .
And since I do have my fur on I’m joining the lovely Catherine at (notdressedaslamb)for “i wear what i want challenge”. It’s very true, silver and gold can’t be measured by wealth, but only in the pleasure we find and give here on earth. As always my friends thank you so very much for dropping by. May you have a wonderful day. Now it’s your turn to share and please do! 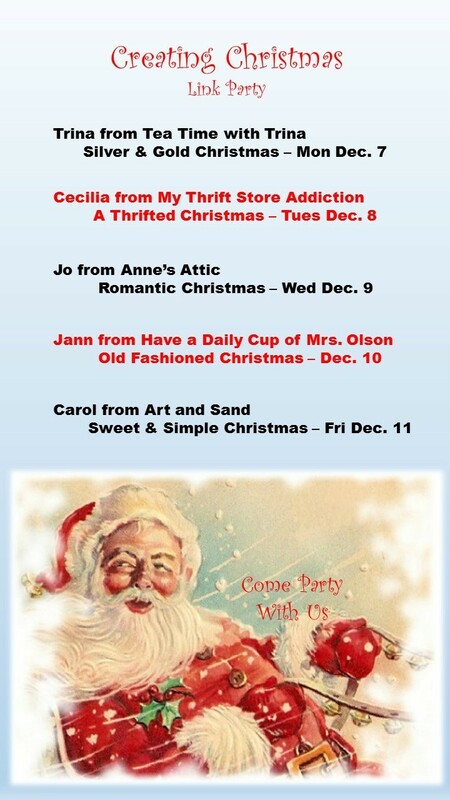 This post will stay open until Christmas Eve so come back as often as you wish and be sure to visit Cecillia tomorrow from my thrift store addiction for her love and ideas on thrifting Christmas. Here’s a little reminder for the entire Creating Christmas Party. Click below to link up your silver and gold. Trina, you have outdone yourself girl! 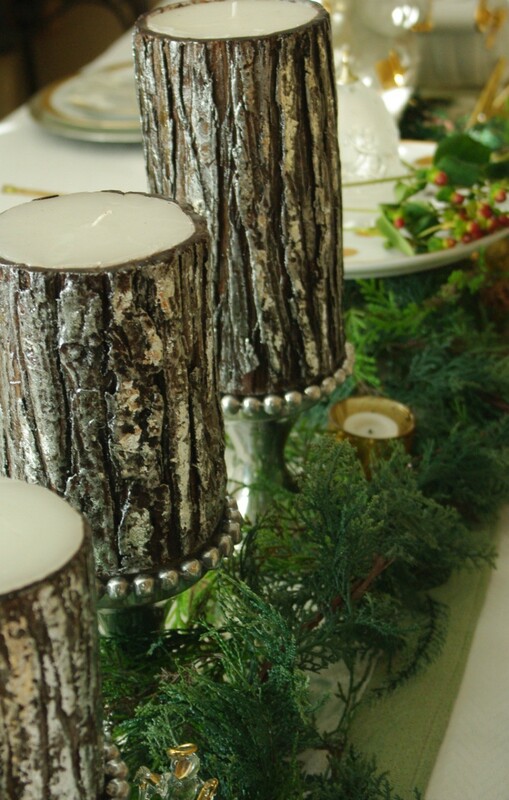 Love your gorgeous tree and beautiful tablescape! And, as always; you are styling it fabulously!! Thanks for joining the party. Jann, thank you for having this fun party! It inspired me or rather motivated me to get it all done. Oh, how fun will the silver and gold necklace be, can’t wait to see it. 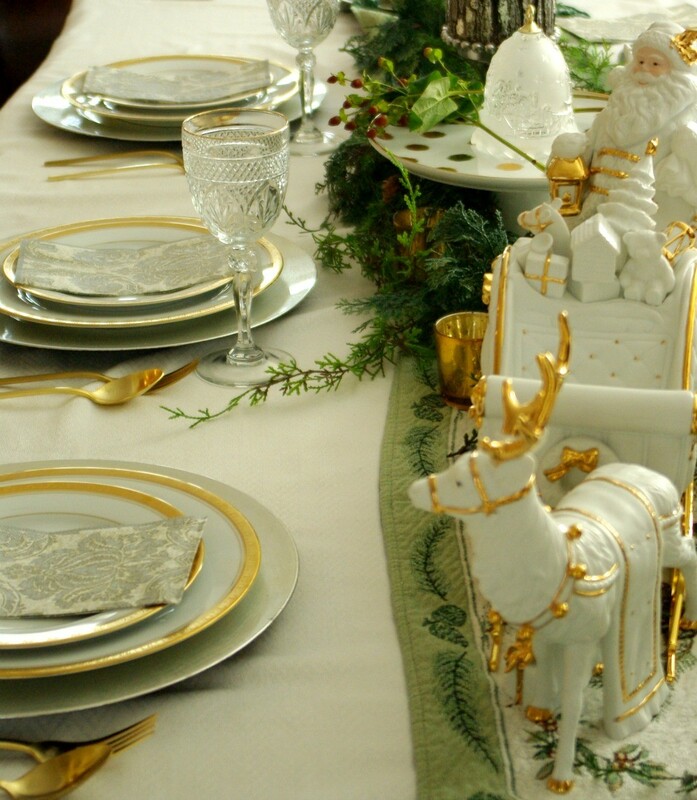 Link up your tablescape and necklace when you get them finished. Thank you my friend. I was quite heart broken when I saw your incredible succulents last week, as I had left mine on my front porch because the weather had still been wonderful. Then we had our first snow fall and I came home to frozen and dead pots. I usually bring them inside and half of them usually survive the winter but I will need to start over this year. Wow! 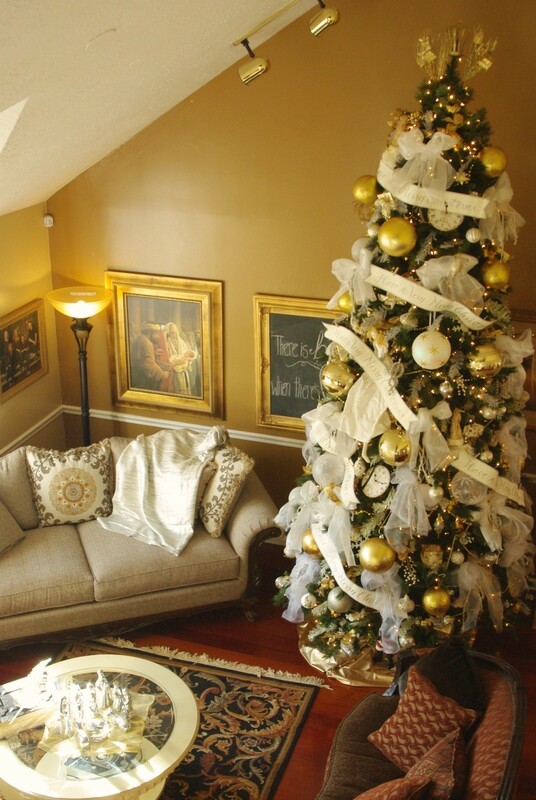 I feel like I need to come and take some decorating lessons from you : ) And maybe borrow your tree. Hey…I posted onto that linky and nothing happened. It looked like it was but I don’t see anything here. Not sure if I did it correctly. Let me know. Thank you! And yes, it’s posted, I love it. With word press you don’t see the other post until you click back on the link. Trina, this is all beautiful. 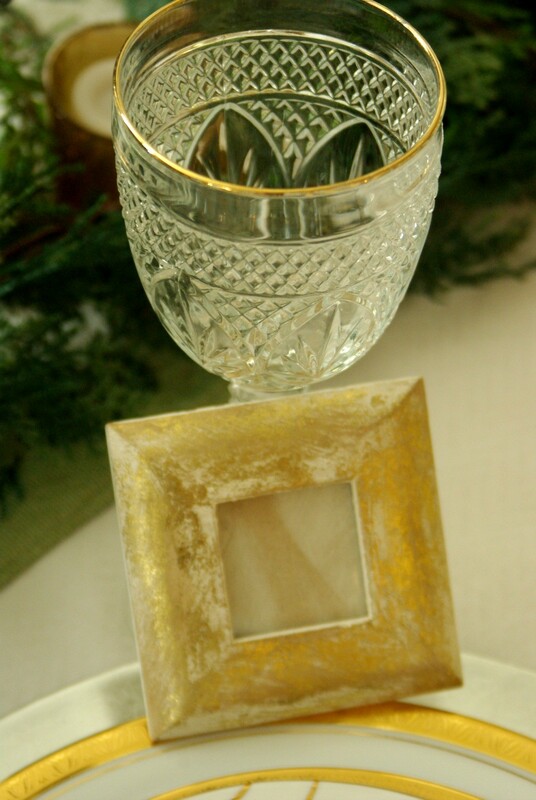 Your decor is so elegant with the gold and white. I love your fashion sense too. Thank you Stacy and thanks for dropping by today. I love the silver and gold theme. 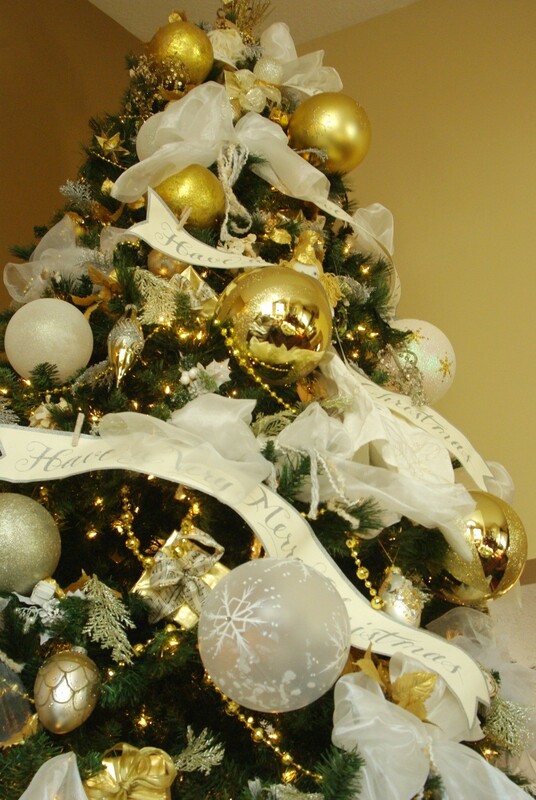 your tree is so pretty! 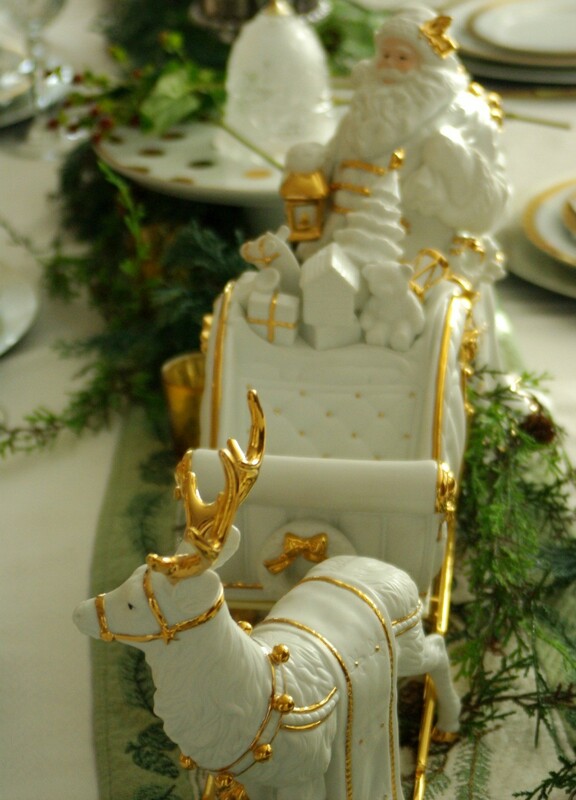 I love the way you carried it to your elegant table, and the silver ornament, as place marker is brilliant. Also love your cozy and chic winter outfit. Enjoy the holiday season! Thank you Elle, please join in the party, I know you have a ton of silver and gold to share. By the way, I had a most wonderful Thanksgiving in your home town city last week. Thank you for scheduling such perfect weather for my little get away. Thank you, my cute friend. 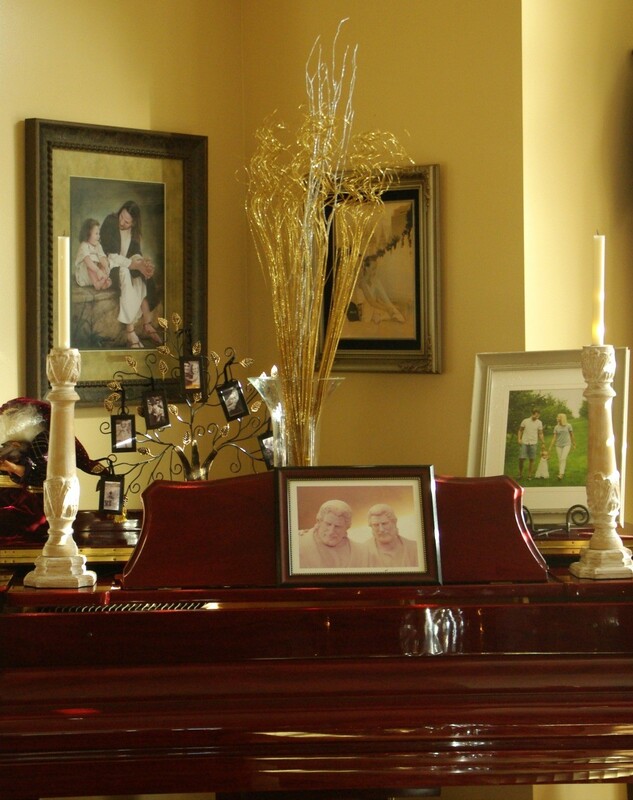 I’m so looking forward to getting a glimpse into your home in a few days. 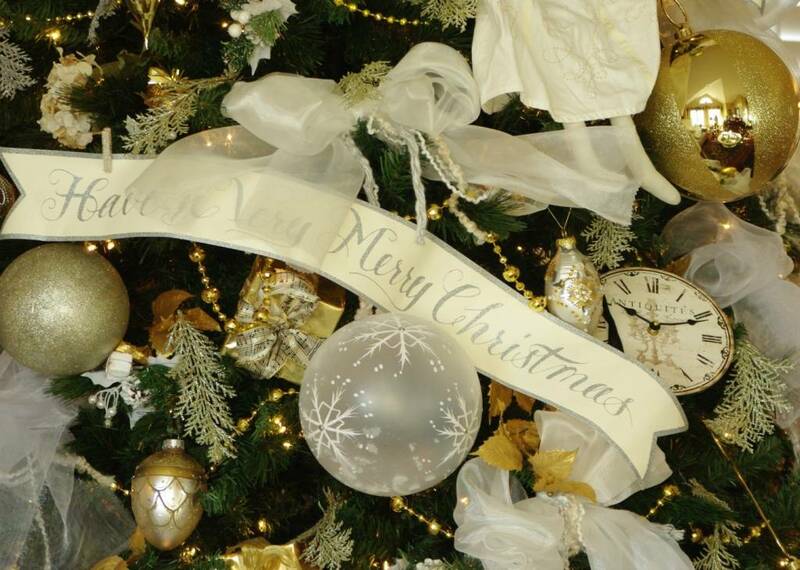 Trina, I’m happy to join you in Creating Christmas. It’s my first intro to you and your blog, and I’m happy to make your acquaintance. 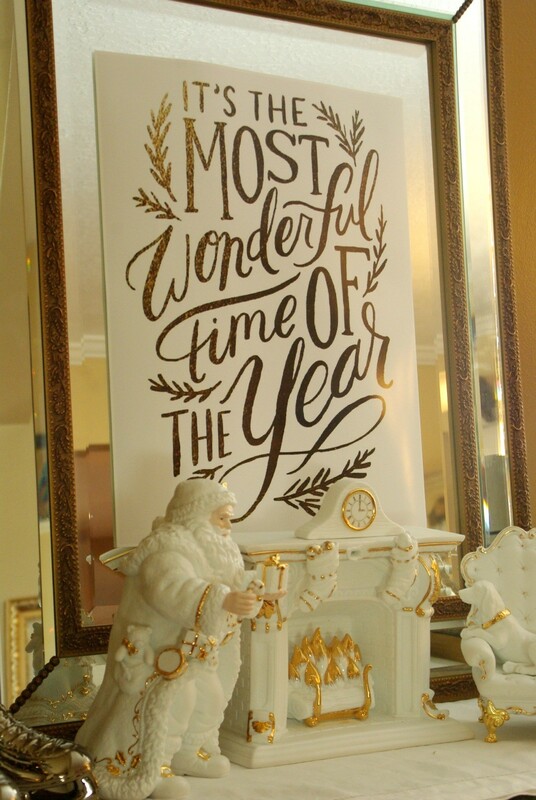 Your decor is lovely, and you look terrific in your gold & silver outfit! Happy holidays! Rita, thank you so very much for joining in and dropping by. Can’t wait to take a peak over at yours as well. You did a wonderful job meshing silver and gold! 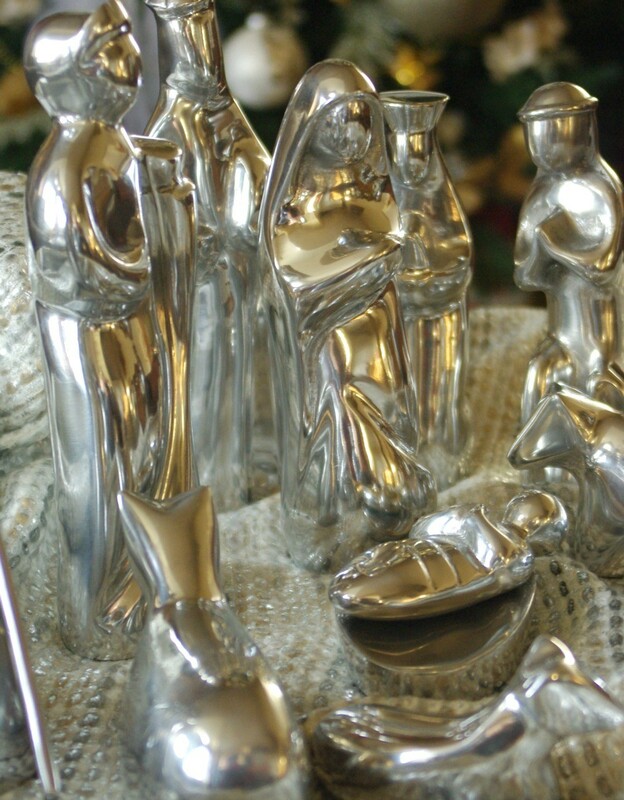 You did a beautiful job of meshing silver and gold! Oh my goodness. Your tree and house are fabulous!! We need to get our things out this week and start decorating. Love your shiny shoes too! Oh, thank you! That tree has quite the fun story, I’ll have to give you a call and we’ll chat. On a day you need a good laugh. You just need to stop your shopping and stay home, haha. Your decorations are so pretty. As is your outfit. 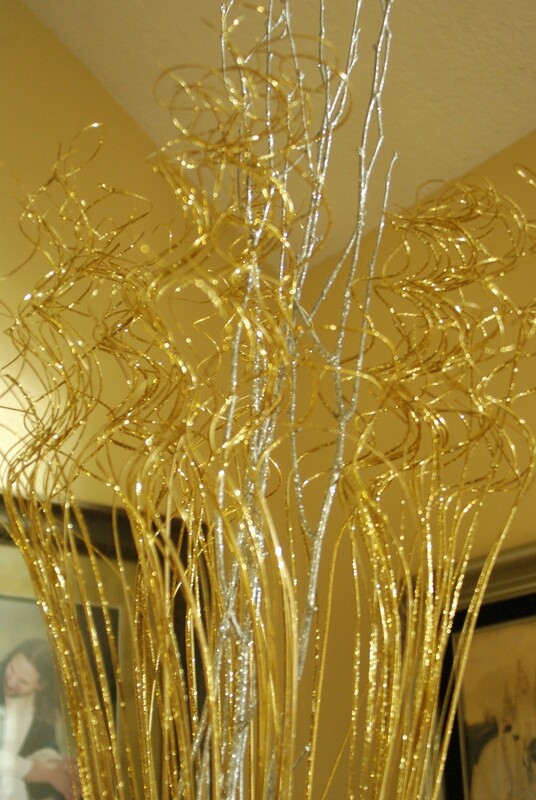 I just don’t know what to link up with.. Christmas decorations in gold/silver? Or clothes in those colours? Am I being thick here? Link up which ever one you like the most or both for that matter. 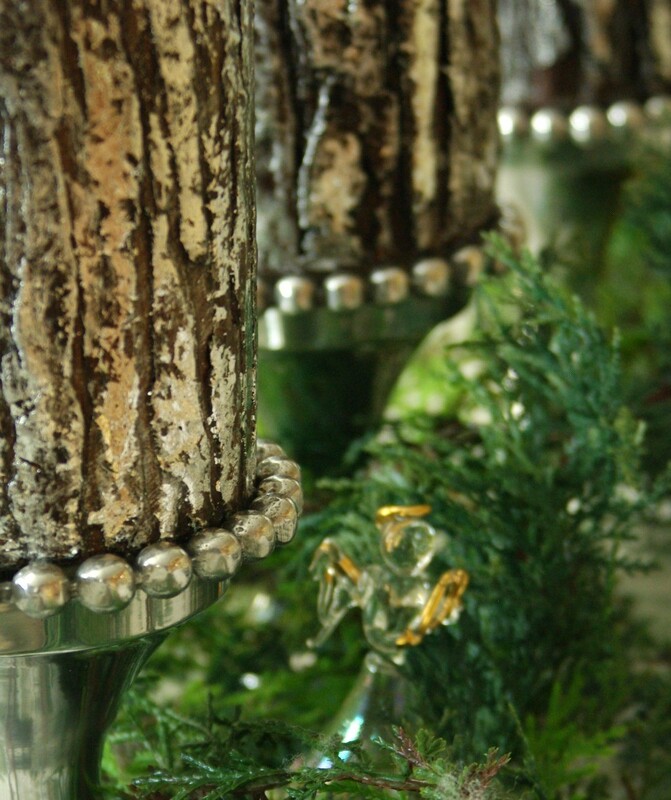 I’m glad to have found your blog through the Silver and Gold party! I love your style!